In 2005, the then French President, Jacques Chirac, described Finnish cuisine as the worst in Europe. Of course, while he is entitled to his opinion, others do have different opinions, and many people think that Finnish cuisine has much to offer. Traditional Finnish cuisine shares much with German cuisine, Russian cuisine, and Swedish cuisine, although it tends to differ from Russian cuisine by using little or no sour cream (smetana), and from Swedish cuisine by being less sweet. Some things to particularly look out for in Finnish dishes, are the use of wholemeal (barley, oats and rye) and berries (blueberries, cloudberries, lingonberries and sea buckthorn) as an ingredient in many dishes. You will also observe that dishes from western Finland tend to use meat and fish more prominently, whereas dishes from eastern Finland tend to emphasize mushrooms and vegetables. Graavilohi - Raw salmon cured with salt, sugar and dill. Hernekeitto - A soup made from green peas, pork and mustard. It is often eaten on Thursdays with pancakes for dessert. Kaalikääryleet - Cabbage rolls (cabbage leaves stuffed with fillings), often served with lingonberry jam. Kalakukko - Fish (vendace, perch or salmon) baked inside a loaf of bread. Sometimes pork with potato or rutabaga may be substituted for fish. Kylmäsavustettu lohi - Cold smoked salmon. Leipäjuusto (also known as "Juustoleipä") - A sort of pancake made from Finnish squeeky cheese (a cheese made from the rich milk of a cow which has recently calved). It can be eaten hot or cold. Rössypottu - A stew made from blood pudding, pork and potatoes. From the Crown Classic Cookbook series--which features a collection of the world's best-loved international cookbooks, specially adapted for use in American kitchens. 400 old-country recipes including delicious baked goods, pasties, vegetable pancakes, fish, sausages, and the sensational coffee table. “The Ultimate Finnish Cooking Experience: The Finish Cookbook You Will Love! Finnish Recipes For Everyone” is your new best friend in the kitchen! Whether you want to impress some important guests or you want to make something special for your friends or family, this cooking guide is what you need! You will learn how to make the most delicious, traditional Finnish dishes and that will certainly impress everyone around you with your newfound cooking skills. This book will change the way you view traditional Finnish cuisine and will make you and your loved ones simply fall in love with it. This cooking journal will help bring some of the most incredible tastes and flavors in the world, right into your own kitchen! These easy to follow recipes are presented in clear, easy to follow instructions. Meaning anyone despite their experience level of cooking can prepare any of the dishes with relative ease. Immediately becoming an expert of Finnish cuisine! So, what are you waiting for? Now that you own your very own copy of “The Ultimate Finnish Cooking Experience: The Finish Cookbook You Will Love! Finnish Recipes For Everyone” it’s time to get too it! Enjoy this experience and discover an amazing cuisine! Discover the earthy flavours and unexpected delights of Finland's healthy, hearty cuisine, which historically has combined its traditional methods and ingredients with flavours and techniques from eastern European and Scandinavian neighbours. The Kaleva Cookbook is a collection of favorite recipes of the Ladies of the Kaleva, of which have been shared in our homes and among our member gatherings and dinners for years. The contributors to this cookbook are members of the Knights & Ladies of Kaleva, a heritage association started over 100 years ago by Finnish immigrants who made a new home in Massachusetts, proud to be new Americans but who wished to preserve their culture for generations to come. Like our Finnish-American heritage, there are recipes from both the Finnish kitchens of our parents and grandparents, as well as favorite American recipes that have come to find their place in our families’ hearts and stomachs. Some of the recipes are original family inventions, often passed down from parent to child; while others were shared by friends, found in cookbooks and even from the internet. Additionally, we have included fun and delicious recipes that are both traditional as well as modern to the Finnish dining table. We encourage you to try these exciting recipes and expand your taste buds! 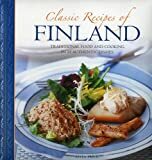 “Cooking of Finland; Old and New” is a collection of Finnish and Scandinavian recipes handed down through generations. Finnish foods have similarities with those of the other Nordic countries. There are also influences from many other cuisines of Europe including Russian, German and French. The old recipes have been modernized and modified. The reason for compiling this cookbook was to preserve the recipes for friends, family and those interested in Finnish cooking. Discover the unexpected delights of Finland's hearty cuisine in this little book on Finnish food and cooking.